The Environmental Studies Council hosted its annual fundraiser at The Monarch Country Club in Palm City on Jan. 16, with distinguished speaker and scientist Dr. Derek Burkholder of the Guy Harvey Institute and Nova Southeastern University, speaking about shark research and conservation efforts. The luncheon celebrated the much-loved Environmental Studies Center, which provides a science-based, hands-on environmental education curriculum to students in Martin County schools. Each year the Jensen Beach-based Environmental Studies Council, a 501(c)(3) established to support the center, provides funding for college scholarships, a teaching position at the center, educational outreach programs, new exhibits and much more. Most recently, the council raised funds for the center’s new sea turtle tank and exhibit and secured funding from the National Save The Sea Turtle Foundation to restore the River Scout boat. At the luncheon, supporters enjoyed a three-course meal while shopping an extensive silent auction. 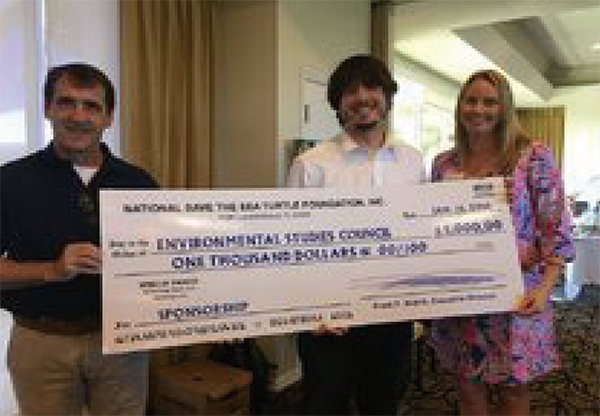 Larry Wood from the National Save The Sea Turtle Foundation kicked off the afternoon with the presentation of a $1,000 check to support the council’s fundraising efforts.